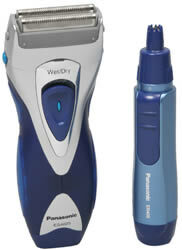 Our Gift Set also comes with a wet/dry ear and nose hair trimmer. The perfect compliment to the triple blade Men's Shaver. Both items are great for taking care of a man's daily grooming needs. Panasonic technology allows your shaver to be fully immersible in water. You can shave wet with lather or dry for your convenience. When you're done shaving, simply rinse clean under water. Independent floating double heads follow facial contours to provide a clean, close shave. All inner blades are precisely angled to firmly shear off your beard closely and comfortably. The pop-up trimmer is great for grooming your moustache or sideburns. Just pop up when ready to use and tuck away when you're finished. This page is part of GeneralManual.Com Network Panasonic ES4025CMB Shaver/Trimmer User Manual.